This Cheeseburger Casserole is loaded with the flavors of a classic cheeseburger, but in comfort food form. 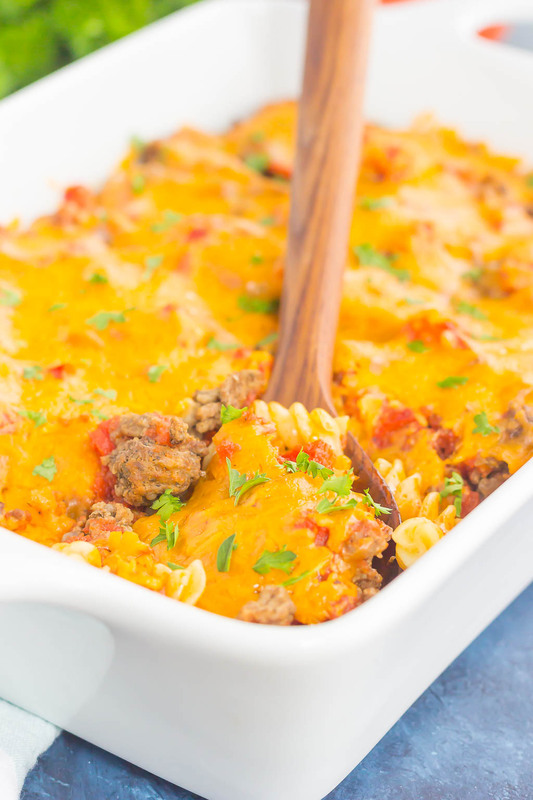 Tender pasta, seasoned ground beef, and a sprinkling of spices and cheese make this dish a family favorite for dinner! And now you’re probably asking why I live in the Midwest…right? Yeah, me too! But, that will change one day. And I have to admit that the first flurries of the season are pretty, as is the first snowfall. But, after the holidays are over, I’m ready for spring. No more snow and cold weather, please! Until then, I’m trudging through winter with the best tool that I have: food! But, not just any food, comfort food! You know, the kind that’s hearty, warm, and sticks to your ribs. There are a lot of dishes out there that I love, and I’ve just happened to stumble across a new favorite that got the hubster’s approval (which is saying a lot!). And nothing says comfort food more than a warm and hearty casserole. Am I right? 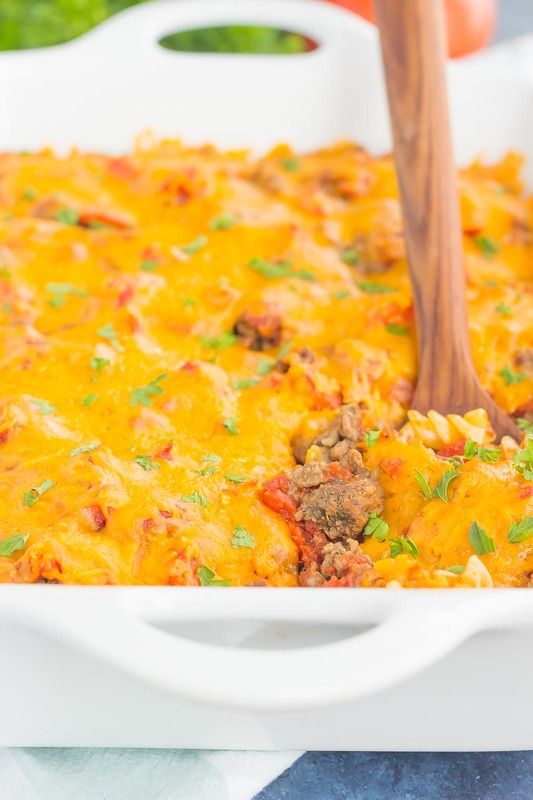 If you love cheeseburgers, then this Cheeseburger Casserole was made for you. I was inspired by this recipe from a Taste of Home magazine, and I’m so glad I was. The flavors and simple ingredients make this a meal-time winner! And easy…talk about an easy meal! But, you knew that was coming, right? After all, I’m all about those simple to make, family-friendly dishes, and this one couldn’t get any better. 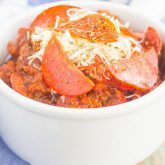 Simply cook the pasta until tender, and then toss with some seasoned ground beef, chopped tomatoes, tomato sauce, and a sprinkling of cheese. Pop it into the oven and in no time, your hearty, comfort food will be ready to be devoured. See, told you it was easy! 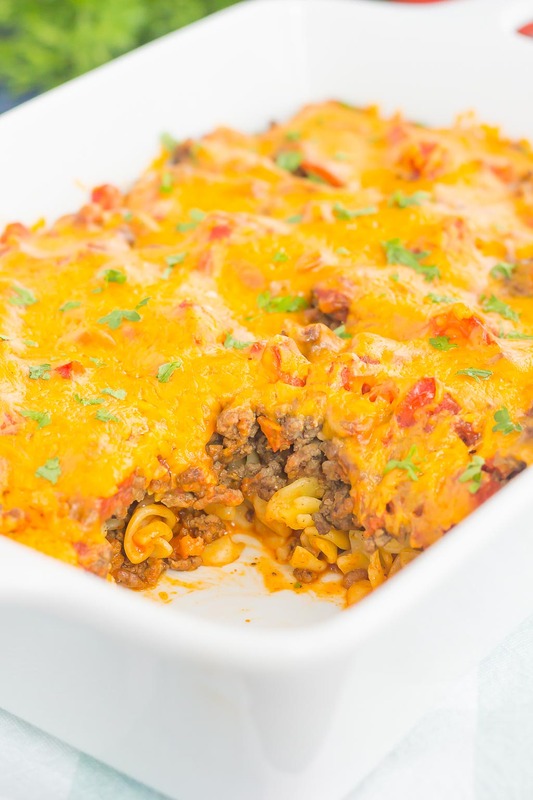 The best part about this Cheeseburger Casserole is that it’s so easy to customize depending on your tastes. Have picky eaters that don’t like tomatoes? Leave them out! Love pickles? Add it in. Want a heartier sauce? Switch out the tomato sauce for spaghetti sauce! The possibilities are endless! So, forget about those cold-weather blahs, grab those ingredients, and whip up this warm and cozy casserole. Your tastebuds will thank you! 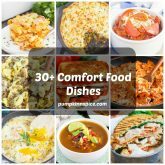 Looking for more comfort dishes? I’ve got you covered! Preheat oven to 350F. Lightly grease an 8x8 casserole dish with non-stick cooking spray. Set aside. Cook pasta according to package directions until al dente. Drain and pour into prepared dish. In a large skillet, cook and crumble ground beef, onion, Italian seasoning, and garlic powder until beef is no longer pink. Drain, if needed. Add beef mixture to prepared dish. Add about half of chopped tomatoes to beef mixture, followed by tomato sauce, seasoned salt, and black pepper. Toss everything together. Add rest of chopped tomatoes on top of mixture, followed by cheese. Loosely cover pan with foil and bake for 35-40 minutes, or until mixture is bubbly and cheese is melted. Remove from oven and let cool in pan for 10 minutes before serving. Casserole can be easily customized depending on your tastes. Spaghetti sauce can be swapped in for tomato sauce, pickles can be added, etc. I honestly don't know how you survive the Chicago winters! I think Virginia is tough...and escaping to Florida to see my brother last weekend was like a dream come true! :) This is definitely the season for comfort food, and your casserole looks like to a total winner. My boys would go crazy for this combo! I'd like to say that I'm used to the winters, but I'm not, sort of! :) Thanks for the casserole love, Blair! I don't think I could hang with freezing weather for an entire winter...living in CA has made me a wuss! 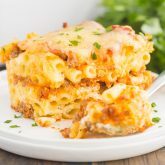 haha It's actually cold here right now and this casserole looks like the perfect dinner to cozy up to. My kids wouldn't be picky about this meal! I'm so jealous of your California weather! Thanks for the casserole love, friend! I'm right there with you on being completely over winter. LOL. 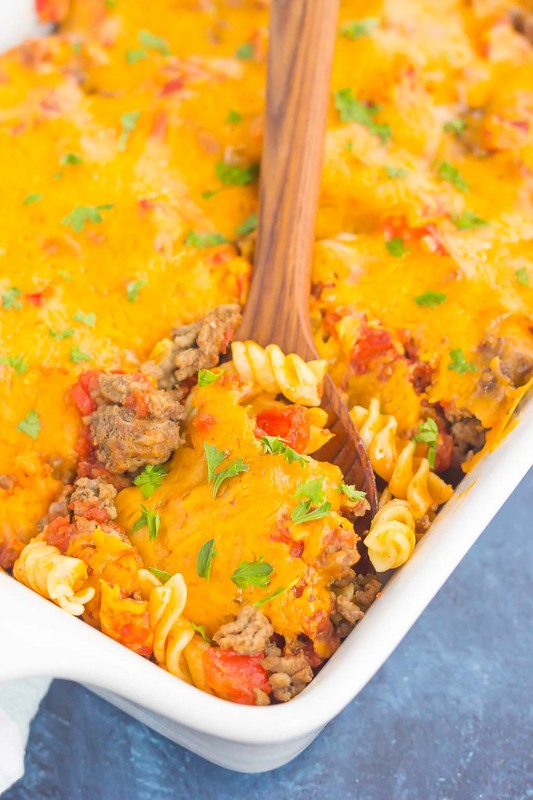 Until the temperature gets above 30 I'm gonna be eating ALL the comfort food and that definitely needs to include this cheeseburger casserole! LOVE how ultra-cheesy it looks! Winter needs to end, and now! Thanks, Sarah! I don't mind winter (but, um, then again we live in North Carolina where it's not really all that bad! :) lol). But I do get sick of dreary days - we've had so many lately! ANYWAY this casserole sounds so cozy and comforting! I agree, winter is so not good! I can't wait for spring & summer! This dish sounds so comforting Gayle! Has anyone 'actually' made this casserole yet? I'd like to see their comments relating to this recipe, NOT to read their comments about the weather. They should send their weather related comments to Jim Cantori @ The Weather Channel. Hi Angelina! People have the freedom to respond however they would like, so no need to be rude. Since there are no comments related to making the recipe, I would assume that those who commented did not make it yet. However, if you try it, I would love to know how you liked it. This recipe was just posted last week, so it's fairly new. Hey Gayle: I can't believe that you perceived my comment to be 'rude', since I was only stating the obvious. I'm really offended! I live in the REAL world, and believe in the freedom to voice my opinion, which I did, and I was NOT being rude! I was looking for reviews of the recipe, that's all. I didn't realize that your blog is also a forum for meaningless chitter-chatter. 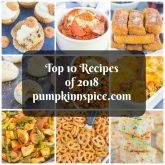 Actually, yes, this is my blog and if you've read anything else, you know that I love to chit chat, as well as share the recipe. Your comment was rude, stating that weather related comments can be put somewhere else. People do have the freedom to respond in whatever manner they like, voicing their opinion like you stated in your comment, but to comment something like that is certainly rude. Politeness, Angelina...too much rudeness in this world. What a disgusting sense of entitlement Angelina has. Why don't you quit complaining, make the casserole, and post a review yourself? So rude of you. Sarah: Talk about being rude! I made this dish, and I'm sorry to say that in my opinion, it wasn't anything special. But, after all, I'm a Chef and a Caterer.